The wood is from the spar of a 1946 Aeronca Champ aircraft. The spar was replaced due to an incident which damaged the wing. It is Sitka Spruce which comes from the west coast of the US. Likely cut during the war, when totally irresponsible cutting took place because of urgency. A spar today costs almost a thousand dollars due to limited supply of Aircraft Grade, which has a minimum number of rings per inch, maximum slope, etc. There are typically two spars in the wing, running from the fuselage to the wing tip. Forward spar is behind the leading edge, typically at the thickest point on the airfoil. Aft spar is further back, typically just in front of the ailerons and flaps. Ribs give shape to the wing, running fore and aft, spaced every foot to 18 inches. This type of aircraft, known as “rag and tube” typically had a fuselage constructed of welded steel tubing, a wing with two wood spars, fabricated ribs, all covered with Cotton for American aircraft, Linen for British. Covering has typically been replaced with Polyester. 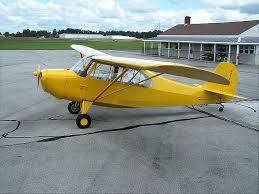 This particular aircraft, the Aeronca Champ, was a prewar design with a 65 hip engine, no electrics. 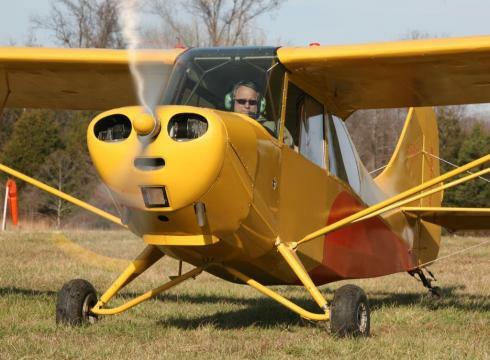 It is a tandem two seater typically used for training or private flying. Thousands were used by the US during the war as basic trainers, Liason, or Observation. 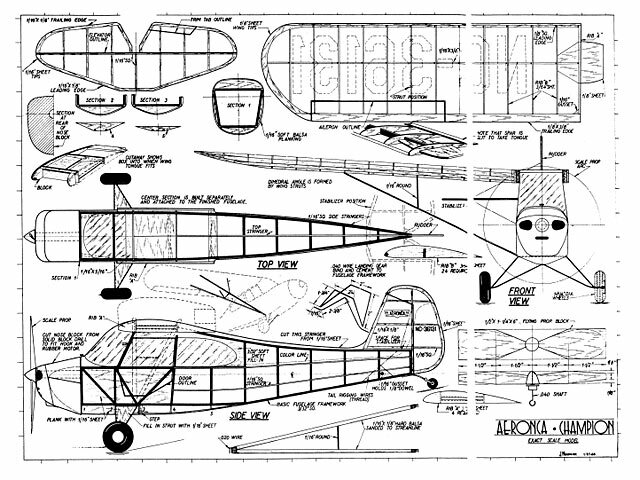 Piper Cubs were of similar construction and used for similar purposes. After the war, there was a glut of such aircraft, 1946 was peak year for production, many of those aircraft not being sold for years after. An aircraft identical to this one was rented by a young 2nd Lieutenant December 7 1941 to take his son flying over Honolulu. Despite the aircraft being Orange, He was not noticed by the Japanese attacking Pearl Harbour, and landed safely inland. That aircraft is now displayed on the quayside beside the Missouri which is berthed where it was on that day. These aircraft are started by hand; the propeller is “propped” by flipping it in the direction of rotation. Kind of like starting a lawnmower etc. ; the propeller provides a convenient “handle” to turn the engine. Manufacturer of this Aircraft was Aeronca. Model is Champion 7AC. Various successor companies; currently American Champion. Current models all patterned after the original are the Scout, Explorer, and Citabria. In current models, the wood spars have been supplanted by Aluminum because of a better availability and consistency of material. The wood spars are available; four spars, two in each wing, approximately $1000 each spar. In this video I am re-visiting the wood left over from a previous commission. Here, I have decided on the piece that I am going to use, approximately what the size should be and I am speculating on whether it should be a bowl or a vase. Including the anomaly has me tending towards a vase as it would show off the gaps to great effect. Due to a hole that would pass through the top ring, I decide to make the piece slightly smaller. The top ring provides a considerable amount of integrity to the piece and I prefer to have that ring as solid as possible. Here, I explain the problem. I have also decided that this piece is going to be a vase. When I cut the rings, the top one is cut first and then the subsequent ones. As I cut them, I stack them up to get my first look at how the piece may turn out. This is a short explanation of arriving here and where I go next. This video is just a fun interlude where I show how a vase is made from a flat piece. This stage is also the first real look as to how this vase may turn out. As with the vase I made from the wood from the Ontario Legislature Building, I have turned and sanded the inside of each ring as it has been added. 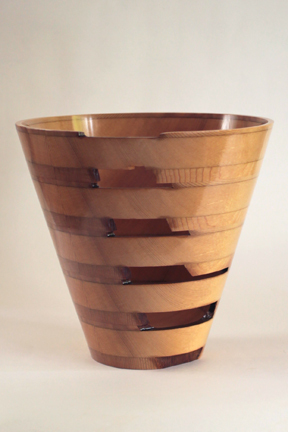 However, this vase presented some problems due to the gaps that were created between the rings. Here I show the solution I came up with to allow me to continue with the turning of the piece. Here is the piece on the lathe with the final ring in place. 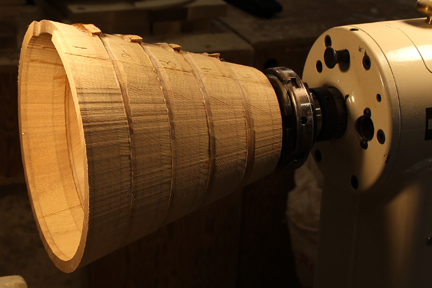 The next steps are to turn and sand the inside of the top ring and then to do the same for the outside of the vase. After some additional challenges in the finishing process I finally arrived at the completed vase. I decided to call it "To Fly Again! ".